This post is presented by SBE, the Society for Biological Engineering--a global organization of leading engineers and scientists dedicated to advancing the integration of biology with engineering. The plant giant miscanthus (GM), a grass of Japanese origins, is proving to be a viable contender for a land-efficient biomass source of biofuels. A patented hybrid has been developed that can yield 25 tons/acre (5 times more that switchgrass), and produces a bio-oil that can be used as boiler fuel, further processed into other fuels or value added products, or reformed to generate hydrogen. 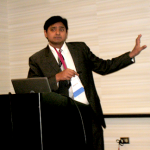 The current state of research efforts was presented by Sanjeev Gajjela, assistant research professor in the Department of Forest Products at Mississippi State University. Harvested GM biomass is first processed to <10% moisture and <3mm particle size. It then is subjected to fast pyrolysis under nitrogen at 425C optimal temperature which yields GM bio-oil which is a dark brown liquid. This GM bio-oil is 20-30% water, and the hydrocarbon fraction is 50% volatiles, 30% pyrolytic lignins and 20% other non-volatiles. 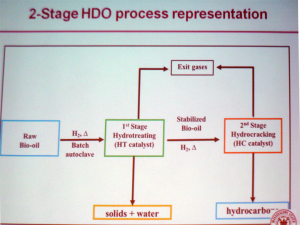 To improve the quality of the bio-oil, further processing steps were developed. In this further refining, a two-stage process of hydrotreatment and subsequent hydrocracking, the yield is an oil with much improved fuel properties. In comparison to pine bio-oil, the raw GM bio-oil has a higher water content and acid number, and because of the water, a lower heating value. It also has a lower average molecular weight of 380, versus 430 for the pine bio-oil. The unacceptable characteristics of this pyrolysis oil led to the need for further processing as described above. The subsequently processed GM bio-oil now has virtually no water and a acid value of near zero. Its heat value is increased to a range similar to petrochemical fuels. The FTIR spectrum of the resultant processed oil shows many similarities to analyses of gasoline and jet fuel. Yields expect to be around 1.5bbl/ton of GM, or 35-40 bbl/acre. The char wastes can be briquetted into useable solid fuel materials. Currently the water waste is the biggest challenge to the sustainability of the process. Trailer-mounted mobile processing units with a capacity of 25 ton/day are envisioned that would localize the bio-fuel benefits and reduce the raw material transportation costs and environmental effects. For more information, contact Sanjeev Gajjela. Is giant miscangthus the next important chapter in biofuels?